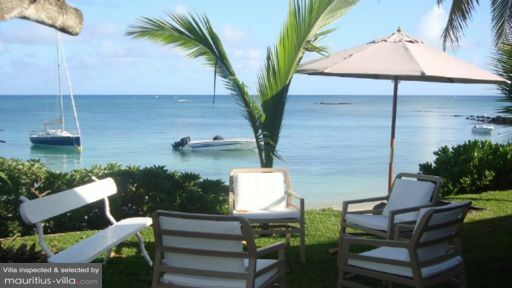 Villa Frenesie 1 is situated just off Grand Bay in Mauritius, and is quaint, little holiday home with three bedrooms. The beautiful property looks out at the sea, and guests need only run outside the door and their toes will hit the sandy shores! With the verdure of the tropical gardens, this tropical paradise is the idyllic space for family and friends to enjoy some downtime in the blissful surroundings of the spectacular island of Mauritius! Villa Frenesie 1 boasts of three, fully-furnished, and air-conditioned bedroom suites. Two of the bedrooms are located on the main floor beside the living area. While one of the bedrooms is furnished with a double bed, the second is furnished with twin-beds, ideally suited for children. Both these rooms have en-suite bathrooms with shower areas. The third bedroom is located on the upper floor, and is furnished with twin-beds as well. This room too has an en-suite bathroom. The mezzanine floor provides an excellent sitting area, well-furnished that overlooks the lagoon! The mesmerizing beauty of the sea outlines the panorama of Vila Frenesie 1. With the sparkling blue waters and the white sandy shores of the beach are inviting and almost irresistible! You would wish to jump right into the water and frolic under the sun with your family and friends. The villa itself is marked by flourishing tropical gardens, rich with plants, towering palm trees and sweet-smelling flowers all around. The natural setting is perfect for when you want to enjoy a cup of tea in the morning or evenings. 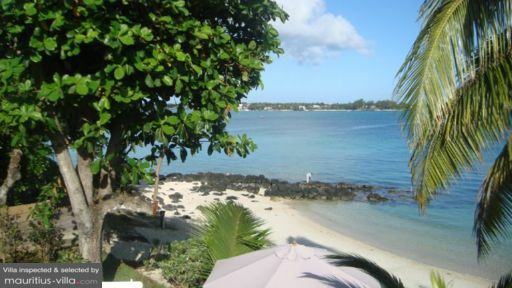 Watch the sun go down as you breathe in the cool, fresh breeze of Mauritius and feel well-rested in its serenity. There are garden chairs placed out front, where you can observe the gorgeous scenery from. You can choose to sit under the shade of large umbrellas, or lounge on one of the sun loungers on the garden. A covered private terrace makes for the front porch of Villa Frenesie 1, and it is furnished with the utmost comfort and pleasure in mind. There are rattan sofas and armchairs on the terrace, perfect for a chat with your loved ones amidst the pleasant island weather. The remarkable view will never cease to amaze, whether you are indoors or out on the terrace! As you step inside through the glass-panelled doors, a pristine and well-maintained living area welcomes you. The living area is furnished with comfortable sofas and armchairs on one side, under a large wall-sized window, overlooking the gorgeous views. The room itself is awash with natural lighting, enhancing the magical tropical atmosphere of the entire space. On the other end of the living area you will find a pretty, round dining table under an overhead light, with six rattan chairs for the guests. There are French bookshelves and other furniture placed around the room, adding a salon-like ambiance. A flat-screen TV is also placed in the sitting area for your entertainment. The guests have access to a western-style, fully-equipped kitchen as well. The villa is fully-staffed and provides exceptional services to its guests including a maid service to ensure the villa remains clean. Guests can request for baby services as the villa is child-friendly. 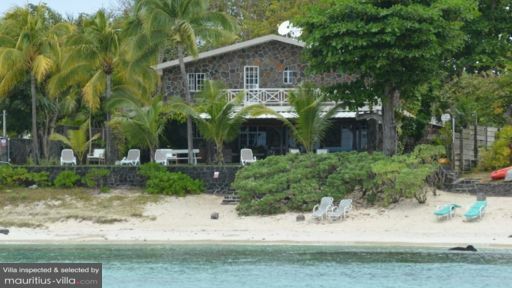 The Grand Baie is only 5-minute drive from the villa, and with beaches like Pereybere and La Cuvette, you can indulge in watersports like kayaking, diving etc. Other places of interest are Tamil Surya Oudaya Sangam Temple and the Grand Baie Bazaar! Bedrooms OK, Garden OK, Staff OK, Equipments OK, no swimming pool but on the beachfront. Owner and agency really caring !! !